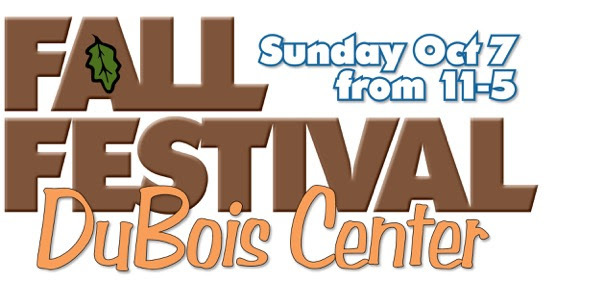 Fall Festival is DuBois Center’s annual friend- and fundraising event, and is held the first Sunday in October. 2018’s Fall Festival will take place on Sunday, October 7, and is open to the public. For information, check out this flyer or keep reading below. Come on out from 11 a.m. to 5 p.m. and join the fun! You’ll find crafters, live music, an Upscale Resale Shop, plenty of delicious food and more. This is a family-friendly event, so bring the kids! They can enjoy our Kids Korner with lots of crafts and games, or any one of our numerous activities around the grounds. Ride a horse, take a cruise on the pontoon boat or tour DuBois via hay wagon. We also have a Quilt Drawing – you can fill out your entry forms in advance by printing this form – or you can fill them out at the festival. Entries are $1 a piece or six for $5. This year, there are three unique and beautiful quilts! Fall Festival is free to enter; parking is free as well. Activities and food are available at an affordable cost. This is a great event for families, church groups and friends. Get out and enjoy a beautiful fall day at DuBois! More details, including directions, can be found below. Each year, we welcome dozens of crafters to DuBois. If you’re interested hosting a booth at Fall Festival, please contact Susan Fuchs at susankfuchs@gmail.com or click here for an information packet. You may also fill out a Crafter Application. Fall Festival is not possible without the help of countless volunteers. They help the event run smoothly, and are needed in a variety of areas. This is a great opportunity for church groups to volunteer together for a service project. Volunteers may also work in shifts should they not be able to attend a full day, or even just wish to enjoy the festival. If you’re interested in volunteering, please contact the DuBois Center office at 618-787-2202 or dcinfo@duboiscenter.org. Sweet Treats – Each year, our Sweet Treats shop raises money for the DuBois Scholarship Fund. We ask for donations of breads, pies, brownies, cookies and more so that all proceeds may go towards helping children and young adults attend summer camp. If you’re interested in donating, you can drop of the treats the day of the festival or arrange for them to be picked up. Contact Melissa at 314-440-6646 or Kristen at 618-567-6863 for more information. *Please denote if your treats contain fruit or nuts. Click here for a flyer. If you would like to help promote the festival, check below for promotional materials! You may also share the link to this page via email and social media. We appreciate your help!